Something else is required, and besides improvements to internal combustion engines, requiring new cars to be flex-fuel, and promoting adoption of electric cars, he most importantly recommends rotating the fleet of heavy tricks and buses to natural gas. Renewables are not yet proven as an economical and scalable solution to energy independence. Nat gas is the transitional fuel. Fracking has led to some huge natural gas finds in the US. (Fracking is the name for deep fracturing of shale, unleashing oil and gas trapped below.) We now have found large enough fields to potentially power the US for the next century. Besides the obvious places in TX, AK and LA, the Bakken formation in the Dakotas has huge potential, and the Marcellus formation under WV and PA is a super-giant which appears to have the second largest reserves globally. You can read more in this downloadable PDF. Ironically, the recent discoveries have trashed the price of gas to make it 21 times cheaper than oil (comparing a barrel at $85 to a mcf of gas at $4) – and some gas producers are going to the “dark side” and now exploring for oil. 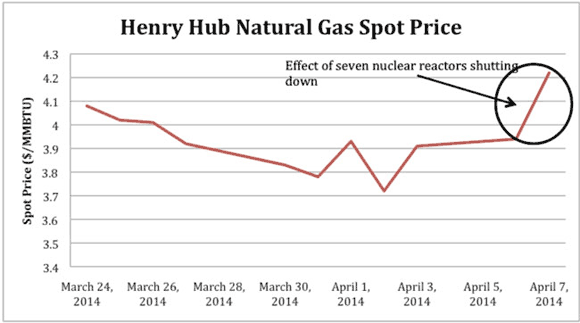 Still the Casey Report notes that when seven US nukes were shut down (temporarily) last week, nat gas spiked up 20%, so there is potential upside in gas as the summer energy season comes. It is a curious story how we missed the Marcellus field in the places where oil was first discovered. It is also not clear how much of the potential is actually recoverable. The discovery came from fracking, a process which is stirring political resistance in Washington. The EPA Co2 regs may be the next shoe to drop, substituting for fiat what could not be achieved via open politics. The EPA imposed new rules on cars, but their upcoming rules on power plants remain murky. It would be a supreme irony if we finally found the transitional fuel to move off imported oil just as political winds shifted against it, deepening our dependence as we chase unproven renewable methods of energy production.